The 6.7L Cummins is the latest of the B-series engine family, introduced mid-model year in 2007. With an introductory rating of 350 horsepower and 650 lb-ft of torque, it is also the most powerful B-series offered in a Dodge/Ram pickup. The 5.9L was replaced by the 6.7L due in-part to stricter Federal emissions regulations, not to mention the fact that the engine design was nearing 10 years old and a more advanced platform was necessary to stimulate future growth under growing constraints. It is the first Cummins to require a diesel particulate (DPF) system, which captures more than 90 percent of soot from the exhaust stream and cleans itself through a process known industry wide as “regeneration”. 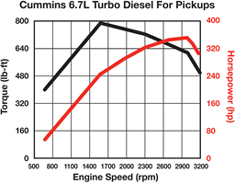 As of the 2017 model year, the 6.7L Cummins turbodiesel produces up to 900 lb-ft of torque. Note – ratings correspond to the factory advertised horsepower and torque in Dodge Ram pickups only. Chassis cab and other commercial vehicle ratings may vary. *Beginning Feb 2011, some early model year 2011 trucks may have 2010 power/torque rating. 2007.5 The 6.7 is introduced with a diesel particulate filter. In response to the profuse number of DPF clogging complaints, several new calibrations are rolled out via PCM re-flashes in an attempt to alleviate the issue. 2008 No significant changes over the 2007.5 model year engine. 2009 An access port is added to the turbine housing of the Holset turbocharger in order to permit cleaning of the VGT vanes. A new fuel filter housing using a dual-element style filter replaces the previous design. The new housing can be retrofitted to previous engines and captures finer particles than the single filter system. In addition, the engine receives a new water inlet housing design and coolant hose/fittings for the EGR cooler. 2010 A single, engine mounted PCM is installed that controls both the engine and transmission (for automatic trucks) – previous models used a separate unit for the engine and transmission. The fuel filter housing is revised once again, now featuring a 1/4 turn drain valve on the side of the housing. A 200 °F thermostat becomes the new standard, a slightly higher operating temperature than (and not compatible with) previous model years. 2011 Selective catalytic reduction (SCR, requiring the use of DEF/urea) becomes standard on chassis cab trucks. Torque is increased for automatic equipped trucks via a new engine calibration. Torque for manual transmission trucks and horsepower for all trucks remains unchanged. 2012 No significant changes over the 2011 model year engine. 2013 Torque is increased by 50 lb-ft for manual transmission trucks. Horsepower and torque are increased for automatic equipped trucks. A High Output variant of the engine is available in Ram 3500 models, backed by an Aisin automatic transmission. See Horsepower/Torque chart above for details. Selective catalytic reduction (SCR requiring DEF) introduced to all Cummins equipped pickups. 2014 No significant changes over the 2013 model year engine. 2015 No significant changes over the 2014 model year engine. 2016 Engine recalibration, torque increased from 865 to 900 lb-ft.
2017 No significant changes over the 2016 model year engine. 2018 Torque increased from 900 lb-ft to 930 lb-ft for H.O. Cummins, only available in Ram 3500 models with Aisin automatic transmission. Ram chassis cab models equipped with the 6.7L Cummins were detuned to 305 hp @ 2,900 rpm and 610 lb-ft @ 1,600 rpm through the 2012 model year, with a governed speed of 2,900 rpm. 2013+ chassis cabs got a more powerful 325 hp @ 2,400 rpm, 750 lb-ft @ 1,600 rpm engine with a 3,000 rpm governed speed. Detuning is common in commercial applications to maximize fuel economy and longevity at the expense of unnecessary power. Chassis cab models began requiring DEF (diesel exhaust fluid) for the 2011 model year, while standard pickups with the 6.7L Cummins did not utilize a SCR (selective catalytic reduction) system until the 2013 model year. A High Output (H.O.) variant of the 6.7L Cummins was released for the Spring of 2011. Torque was increased from 650 lb-ft to 800 lb-ft while the rated horsepower was left unchanged. The H.O. Cummins was only made available for trucks equipped with the 68RFE automatic transmission, and therefore the output for manual transmission versions of the engine remained at 610 lb-ft.
2013 saw yet another push in performance, introducing a total of three variations of the 6.7L Cummins for Ram pickups. The first variation was limited to manual transmission equipped trucks – coupled to the G56 6 speed manual, engine torque was increased to 660 lb-ft (from 610) while horsepower remained unaltered. A second variation, offered in 3/4 and 1 ton Ram pickups and only available coupled to the 68RFE automatic transmission, saw output increase to 370 horsepower and 800 lb-ft. The High Output Cummins, which produced 385 hp and 850 lb-ft of torque, was only available coupled to the Aisin AS69RC automatic transmission and was only available in 1 ton Ram pickups (Ram 3500 models). In addition to these new offerings, SCR (selective catalytic reduction) w/ DEF injection became standard on all 6.7L Cummins. Ram Trucks reported an approximate 10% increase in fuel economy with the new engine lineup utilizing this exhaust aftertreatment technology. To reach and safely maintain these power levels, trucks also received dual transmission coolers, dual radiators, a higher efficiency intercooler (charge-air-cooler), larger capacity EGR system, and a higher efficiency mechanical fan. To increase effectiveness, the VGT exhaust brake system was also enhanced for the revised 2013 6.7L Cummins. 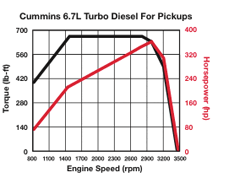 For 2015, the High Output model of the 6.7L Cummins saw torque increased from 850 lb-ft to 865 lb-ft. Though the increase was marginal, it granted Ram Trucks a marketing edge over their nearest competitor, Ford’s 6.7L Power Stroke V-8. In 2016, engine torque was yet again increased for the HO model, yielding a peak 900 lb-ft as a result of a revised engine calibration. The HO engine remains exclusive to Ram 3500 models and comes standard with the Aisin automatic transmission. 2010 (left) and 2011 (right) hp/torque charts shown below.